Out of Court Personal Injury Settlements → Will My Accident Claim Go to Trial? Will I have to go to court to settle my accident injury claim? In the United States, a relatively small percentage of personal injury claims are resolved in at trial. The commonly cited estimate is that just 5% of claims are resolved with a trial, while the other other 95% of personal injury cases are settled out of court. Personal injury cases are among the most common legal actions in the United States each year. If you were injured in a car accident, truck accident, or a motorcycle accident you may have a valid personal injury legal claim. 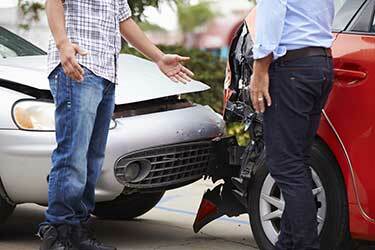 However, not all accidents lead to filing a personal injury claim. In order to have a personal injury case, you must be able to demonstrate that the negligence of another party caused your injuries or property damage. The majority of individuals move forward with a personal injury lawsuit with the goal to obtain financial compensation for the injuries and damages he or she suffered. According to the Texas statute, damages are separated into two categories economic and non-economic damages. Economic damages are based on your financial loss such as loss of income and the cost of medical bills. In some cases, a person may include a loss of benefits from bonuses, pensions, retirement benefits, spouse’s lost wages, and transportation costs. Non-economic damages are to compensate for intangible losses such as physical pain and suffering, as well as mental and emotional anguish. With the exception of medical malpractice claims and certain claims against governmental entities, there are no caps on personal injury claims in Texas. Determining the monetary value of your case can be difficult, but that is where it is helpful to hire an attorney. Hiring an experienced personal injury attorney is recommended because not all lawyers know the ins and outs of personal injury law. Your Texas personal injury lawyer will seek to maximize the damages that are recoverable in your claim by gathering evidence, hiring experts, negotiating on your behalf, or going to court on your behalf. After a car accident or injury, the two most common ways to receive compensation is by making an insurance claim or filing a civil lawsuit. Realize that most cases do not get tired to a jury or judge. In fact, less than 5% of cases filed are actually tried to a final verdict. Meaning most cases are resolved or settled out of court. Despite these statistics, it is important that you hire a lawyer who has the knowledge and experience to aggressively pursue your case. Your decision on who to hire will likely have a significant impact on the final value of your settlement. You want a lawyer that will invest the time, money and resources necessary to demonstrate that you are prepared to try your case if the other side won’t be fair. Insurance companies track all types of data and they are aware of what lawyers are willing to go to court and what lawyers will just settle to avoid court. Is liability clear-cut or will the at-fault try to blame someone else for the accident? When liability is disputed, you must consider the proportionate responsibility rules. The extent of a person’s injury or loss. Does the person need surgery? Did someone lose a loved one? How will the injury or loss affect the person economically? Will the person be able to return to work? Will the person need future medical treatment? In some situations, you need to hire a life care planner to help everyone understand the effects of a person’s injuries and the future care the person will need throughout his or her life. What is the amount of insurance available from the at-fault party? What did the at-fault person or company do? By way of example, juries tend to treat drunk drivers much harsher than a person who just made a mistake. Where is the case pending? Some counties are more conservative than others when it comes to awarding money for certain types of damages. What insurance company is involved? Some insurance companies like to play games and won’t fairly evaluate the case until the last possible minute. What lawyer is representing the at-fault person? Some defense lawyers are more realistic about the value of a claim than others. It takes time, effort and resources to properly investigate each claim and case to answer these questions. Once you have these answers, you can determine what you believe to be a fair settlement value is based on all of these factors. Generally speaking, in terms of settlement, both sides are trying to determine what they believe a jury would award. Most cases settle out of court because, once the facts are generally known, most reasonable lawyers can agree on what a jury will likely do. At that point, it makes sense for both sides to try to reach an agreement to avoid the uncertainty associated with trial. Cases settle because there are risks to going to trial. There are risks that the jury won’t like the defendant and, thus, give the plaintiff a lot more money. The converse is true in that sometimes the jury doesn’t like the plaintiff and, thus, they won’t give the plaintiff the money he or she deserves. While this is not fair, the fact remains that a jury is made up of people who have their own thoughts and opinions about various issues and those beliefs will affect how they decide a case. Given all of the complex questions and considerations involved in each case or claim, we suggest that you find an experienced personal injury or car accident lawyer to speak with about your situation. A knowledgeable personal injury attorney will help you weigh the pros and cons of your claim and help you decide whether to go to court for your car accident case. Can I Fire My Personal Injury Lawyer and Get a New One?